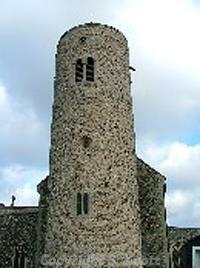 The oblong South Norfolk parish of Gissing is situated about six miles south of Wymondham. Its name comes from the Old English ‘Place of Gyssa’s people’, and the parish has a long history of human occupation. It was certainly well established by the time of the Norman Conquest, its population, land ownership and productive resources being extensively recorded in the Domesday Book of 1086. The earliest evidence of human activity in the parish comes in the form of a few flint tools, prehistoric, but not precisely dateable. These include flakes and scrapers (NHER 24533 and 24892) or just worked flints (NHER 21744). There are no other finds from this very early time until Neolithic pottery fragments found at a site to the east of the village church (NHER 24893). This site has a very wide range of pottery finds from over a long time scale, and may have been a settlement over a lengthy period. Evidence of activity continues to be scarce right up until Saxon times, the only Bronze Age find being a copper alloy palstave (NHER 10930), Iron Age finds being limited to pottery fragments (again, NHER 24893, and Roman remains to pottery fragments (NHER 24893 and 21744), coins (NHER 10931 and 24893) and a brooch (NHER 24893). Saxon finds themselves are rare, a few pottery fragments (NHER 24893) and a brooch (NHER 32025). However, in 1849, a Saxon burial was found, together with two Early Saxon brooches (NHER 10961), the earliest monument in the parish. The medieval period following the Norman Conquest has left the parish with its oldest surviving building, St Mary’s Church (NHER 10932). This is a fine and early example of a round-towered church; the tower and nave are late 11th century, the chancel and chapels 13th century and the two storey north porch 15th century. Inside is a very fine double hammerbeam nave roof and an octagonal font, both 15th century, and 17th and 18th century monuments to the Kemp family, lords of the manor for some six hundred years. Other medieval buildings do not survive, but have left a footprint in the form of their surrounding moat. The best example of this in the parish is the double moated site of medieval Gissing Hall (NHER 10942). Nothing remains of the hall, but its moats, now dry and filled with dead wood, can still be seen. Other moated sites, often disturbed by later activity, are at NHER 21744 and 10968. Some medieval buildings survive as fragments of later rebuilds. For instance, numbers 40 and 41 Upper Street (NHER 25243) are a large 17th century plastered timber framed building, now subdivided, but built onto part of an original hall house of about 1400. Another example is Malthouse Farm (NHER 33813). This thatched house, fairly unremarkable from the outside, though it has a fine Regency doorway, was originally an early hall house, possibly 14th century. The surviving post medieval buildings in the parish date mainly to the 17th century, of course with later alterations. The Cottage, Upper Street (NHER 40695) is a 16th and 17th century plastered timber framed house. White House (NHER 15746), The Crow Inn (NHER 22956), Marler’s Farmhouse (NHER 38181) The Bakery, 42 Upper Street (NHER 40694) and the Poplars (NHER 40814) are also all originally 17th century. Gissing Hall (NHER 12078), home of the Kemp family until 1920 and now a country hotel, is the remains of a late 17th century rectory, to which an impressive Tudor style red brick mansion was added in the late 19th century. 18th century buildings include The Chequers on Upper Street (NHER 33567), a thatched former pub, Bloomfield House, Upper Street (NHER 40696), an early 18th century row of timber framed cottages, now converted to one house, and Poplar Farm Barns (NHER 40813), a courtyard of 18th and 19th century former farm buildings, now thought to have been converted to residential use. The most historically recent entry on the record is a World War Two concrete pillbox (NHER 18475), situated on the north boundary of the parish on the B1134.